Prior to choosing our project, we’d looked at pretty much every kit built plane that is made, both in print and online, and then in person, as much as possible. I did all the internet research I could, asked friends, etc. To a degree, I did this research in a vacuum because I just don’t know that many people who own, build, or fly home builts. The primary criteria for choosing a kit design wasn’t payload, cruise speed, or number of seats. Heck it wasn’t even cost. It was whether I fit in the plane or not. You see, I’m 6’5″ and 200 lbs. However my height is in my torso so sitting down, I sit like a person who is 6′ 8″. That means that my head is crammed into the ceiling of almost any airplane. This includes almost all modern certified airplanes. My son, Spork, was 6′ at 13 and still growing! So even if I could tough it out and fly with my head crooked, he’s going to be in the same boat. Rather than look at this as a limitation, I felt blessed because being so tall narrowed the choices for us, making the decision easier. Even with the home built field so limited due to my height, it was still extremely overwhelming trying to pick our aircraft. After attending Sun N Fun 2017, Oshkosh 2017, getting my tailwheel endorsement, visiting a professional RV builder, attending one of the build schools (with Spork) put on my EAA at Oshkosh in the off season, attending multiple EAA chapter meetings, visiting the few people I knew who had home builts, and getting a demo flight in two different gyrocopters and one Carbon Cub, I had the following list of possible aircraft. I must be able to fit in the airplane. I must be able to finish the airplane in a reasonable amount of time based on my schedule (which is limited). There must be quick build, factory assist options, etc. Side by side seating strongly preferred. Must be something my kids would enjoy flying in. Must be something my kids could learn to fly in. Should use a Rotax engine, any model. Ability to fly with the windows open or doors off. Fun to fly. Something my kids could discover the joy of flight with. 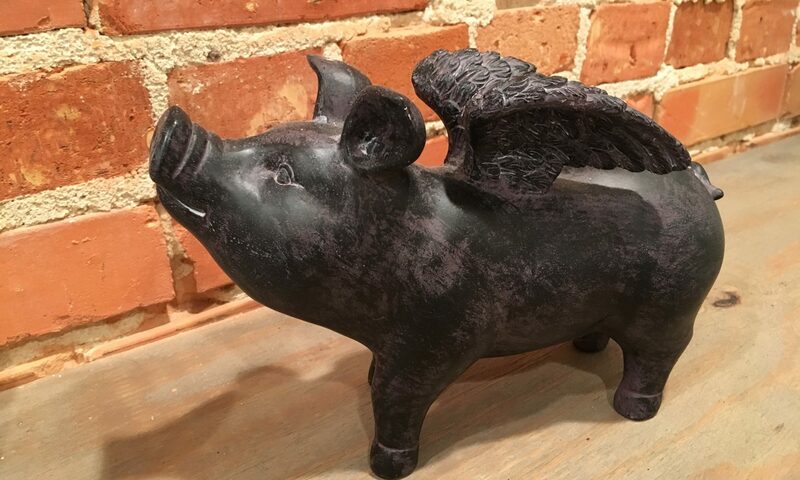 Docile, forgiving, easy to fly. Capability for light/accidental IFR if needed. Well known brand that allows for resale to a known market. So what did I learn after all my research? Autogyro Cavalon – I thought for a good while that the Autogyro Cavalon was the one we were going to get. I went so far as to schedule my transition training and endorsement but that unfortunately went awry due to personality issues with the instructor. I also wasn’t able to fly with the doors off due to the instructor refusing to take them off, something I was determined to do prior to putting down a deposit. I also never really did get comfortable that this thing was going to be usable on our field without having to do some improvements to the smoothness of the field. It just seemed to track fairly narrow and it seemed like bouncing the rotor around might not be the best idea. After all those limitations, scratch that one off the list. Zenith – At Sun N Fun, 2017 Spork and I spent a good bit of time at the Zenith booth and even attended one of their classes. The Zenith aircraft had good STOL ability, a really easy build, good support, no need for taildragger experience and it’s associated risks, a good name, partnership with EAA, and the price was right. However Spork did not like the center stick with Y grips and he also ended up not wanting to build a metal skinned airplane. The 650 was barely a contender. It couldn’t operate from our farm and it was a bit cramped. But technically I fit, barely. Scratch the 650 and 750 off the list. Van’s Aircraft – I only fit in one RV easily and that is the RV-10. I also fit in an RV-8 which was surprising because I had sat in a customers RV-8 and couldn’t close the canopy. But the RV-8 at Sun N Fun worked fine. At Sun N Fun, I spent a ton of time at the Van’s booth. I LOVE the RV 10. It’s my new dream airplane, after a PC-12, a King Air 90, and a F4U Corsair. Of those aircraft, the RV is the one I’ll actually end up owning. I came home from Sun N Fun convinced that the RV-10 was the choice. However it took forever to build even with the quick build options, it was really expensive, it absolutely could not operate off of our farm, and it is a metal airplane. It was pretty much eliminated in every way and I still want one. However, rather than build one, I will buy one already built once Spork goes off to college and I don’t need the capacity of the PA-32 anymore. Plan B is in place for the RV. The RV-8 was eliminated by the tandem seating and the metal build. Plus it too wouldn’t operate off of our farm. Cub Crafters – The Carbon Cub has a great name, and great performance. It’s everything a classic J-3 Cub is with all the modern advantages. Plus their sales people at Sun N Fun were awesome. Chip, if you ever read this, thanks for everything. I ALMOST bought a Carbon Cub solely because of you. But the Carbon Cub had one fatal flaw, tandem seating. I don’t care if I sit tandem or side by side. Actually I do prefer side by side a bit but whatever, I don’t really care. My son? Side by side. My daughters? Side by side. My wife? Side by side. I plan on doing Young Eagles flights as well. What do kids with zero experience want? Side by side. Tandem seating killed the Cub for us. Plus as a zero time tailwheel pilot I wasn’t entirely comfortable I could land the thing that well. Bungie suspension doesn’t have dampening and that made me nervous. Can I learn? Of Course. But it’s just one more thing that was a bit unnerving. Add that to a really expensive build and we nixed the Carbon Cub. Just Aircraft – The Just Aircraft planes had a few things going for it. It was made by some local boys, over in SC. Actually it’s nearly to Georgia but whatever, SC is just one state over so I consider it local. Being able to swing down to the factory makes a big difference if you get stuck or have a problem. I also fit in the airplane, even with side by side seating. There was one cross member in the fuselage that my head kinda got near but not on the top of my head, the back. Turbulence wouldn’t bounce me into it. They had some quick build options and overall it’s not a terribly big build. 1000 hours at the top end of estimates. All of their STOL capabilities were certainly good enough to get in and out of the farm without any craziness and it still retained a decent cruise speed. Range? Check. Enjoyable to fly? According to Youtube, check. Rotax? Check. Just Aircraft actually checked all the boxes in our requirements and despite that, I really didn’t even consider Just Aircraft. I wasn’t looking for a tail dragger. It was an LSA which I didn’t care about, being a certified pilot. It seemed to be a one trick pony in that it was all about off field and short field performance. Yes, I was going to be operating off field, but not like this. In talking with the Just guys, it seemed that maybe the Highlander was a good option for me. It had good enough STOL capabilities to operate from my 1200 feet easily, but it retained some cruise speed over the tricked out SuperSTOL. Kind of the in between aircraft, not all STOL, not all Cessna 170. This was my plan for a while, a Highlander. Then after the debacle with the Autogyro, I made arrangements to fly the SuperSTOL on the way home from Maryland. I’d met Robbie Pedersen when I’d gone to get my tailwheel endorsement at OBX Airplanes in Manteo, NC. I’d met Jenny Hawk, the owner, and my instructor of course. But on day two of landing a Citabria, badly, my instructor had asked if I’d met Robbie yet? Robbie? No, who is he? He’s the guy who flies the Just SuperSTOL and does all these crazy landings. He’s also Jenny’s husband. You should talk to him. I met Robbie there at the hanger and found him very likable and down to earth. He obviously loved flying, which made him an immediate friend of mine. As I was asking completely uninformed questions, Robbie paused and said, have you seen my video? Video?! No. A quick search on youtube and he brought up this. Stop reading. Watch the video. I’ll wait. My jaw hit the floor. Holy Cow! I’d never seen an aircraft land like that. I’d never heard of a STOL competition, or the Valdez competition. This was all brand new to me. And then in conversation I learned that the airplane he used was effectively stock. No super engine, no extra aerodynamic bits. The only thing Robbie had done was to remove the cowling to save a little weight. Other than that he’d won the competition with a stock SuperSTOL. While I didn’t know anything about STOL competitions, I had grown up with this picture burned into my brain though. 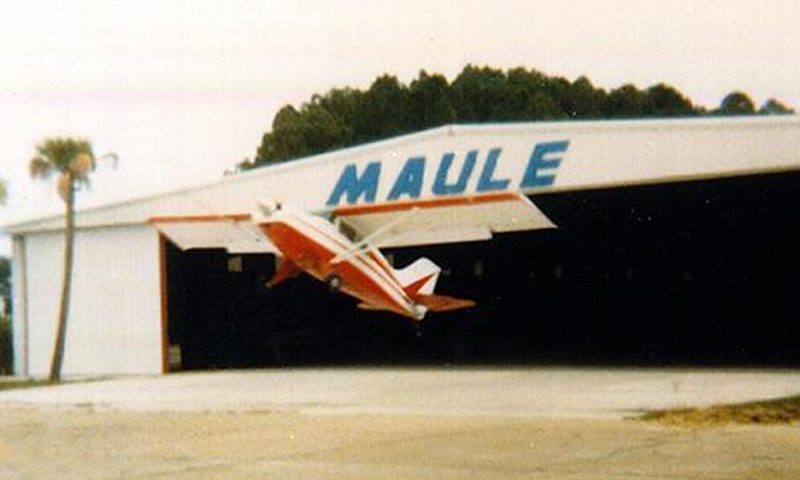 That’s a Maule, taking off out of the hanger entrance. That was always a crazy picture to me, and quite amazing. I mean, I don’t want to do it. Obviously that’s an unpleasant way to fly and an example of maximum performance. I’m more of a sedate, easy going flyer. Regardless, it was super cool and much like posters of Ferraris on the wall of a teenage boy, I was fascinated by this picture as a kid. But actually to fly like that? I honestly thought it would be like going for a ride like this. But with the Cavalon out of play, and all the other choices eliminated, the Highlander/SuperSTOL was pretty much all I had left. I stopped at Manteo and met up with Robbie. His SuperSTOL was covered in bugs, mud, dirt, etc. It looked like someone’s Jeep they kept in the barn, one that climbed mountains and carried baby calves and feed. It was obviously a work horse. As macho as I could, I explained to Robbie that I was a shiny side up pilot and that I didn’t really need to see the maximum performance, loosen the fillings in your teeth landings. I’d read stories of aviation journalist who’d been scared by the landings in the SuperSTOL, coming in tail first and slamming down. I had 1200 feet to operate from so just a sedate demo would be fine. I wasn’t assured that we wouldn’t be going for a carrier ride but oh well, I was here, may as well take the ride. We climbed in and cranked up. The Rotax fired up immediately, as they do. While waiting for the oil temp to come up, Robbie said, “Let me show you something.” He throttled up, and turned right off of the taxiway blasting through the grass. He then chopped the power, stomped full left rudder, and locked the brake. The airplane skidded and pivoted on one wheel and did a perfect 180. As soon as it stopped, he powered up and repeated the demo to the right. He looked over at me and said, “You’ve now ground looped an airplane. Twice.” No muss, no fuss. No wing rocking, or prop strikes. The plane was completely stable. I was impressed. We then took off. I have no idea how far we rolled. Not very far. It’s more about time than distance. Maybe two seconds of ground roll? We made a trip around the pattern and Robbie set up for landing. Our first full landing, stop, and go. 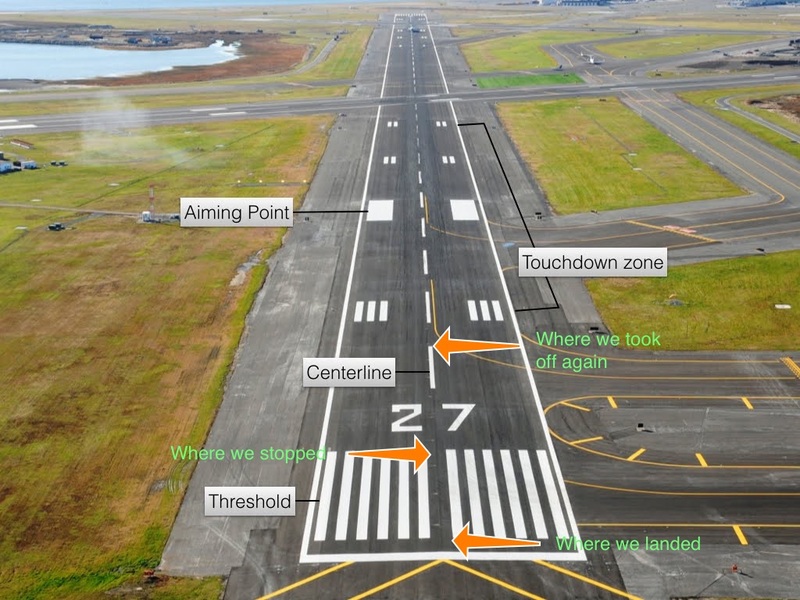 Robbie aimed for the line that marks the beginning of the runway. He missed it a bit and landed at the front edge of the parallel white lines. We stopped and he spun 90 degrees to the left. The fillings were in my teeth and all in all it was actually fairly sedate and comfortable. It wasn’t a crash landing like on the carrier. It was more of a butterfly setting down. We were going SO SLOW that the actual landing and rollout is a non-event. Once again, I had no idea how long we’d traveled on the rollout. It was measured in time. But when I looked where we were sitting, we were still on the white lines, as the arrow above depicts. To put that in perspective, when I’m flying a normal airplane, the second, smaller set of white lines is where I aim to touch down. So we landed, turned around to look, turned back around to take off, and took off, in less space than I normally overfly as part of a normal landing! Robbie spun around and took off again and he gave me the controls. I flew this airplane and all I can say is it was a delight to fly. Light on the controls, well balanced, very stable. We set cruise power and saw about 105 mph. We cruised over to another area and I did some steep turns, turns around a point, etc. It was a very comfortable feeling flying this plane. Everything was just right and with the super short field performance, I felt very comfortable that we could put it down pretty much anywhere, a feeling I had when I was flying helicopters. If I could see a patch of green, I could stuff it in there. This was the same thing, a comfort that an emergency landing would be a funny story, not a trip to the hospital or worse. 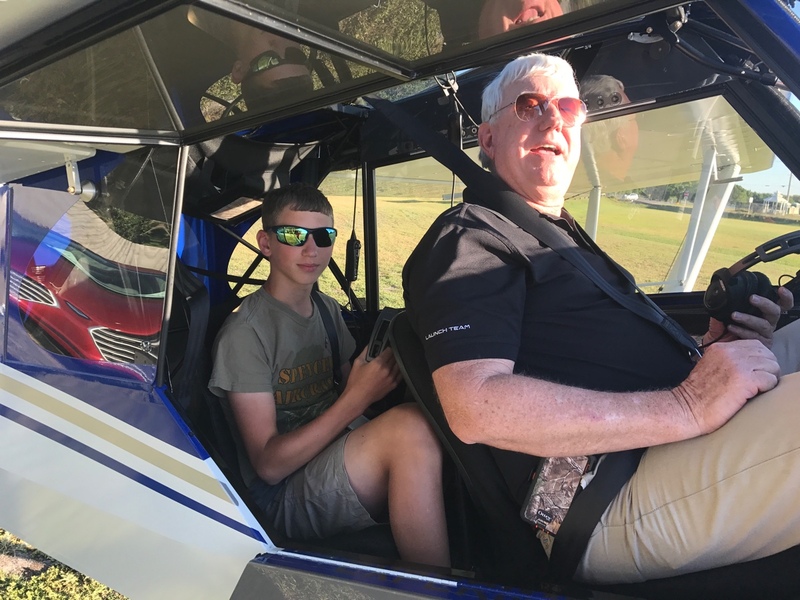 Robbie made an approach to the runway, but at about 30 feet he added in some power, pitched up, and proceeded to fly down the runway at about 20 feet off the ground, and at about 15-20 mph. He’s talking about how you look for ditches, rocks, etc, and demonstrating how controllable the airplane is all the while, walking the airplane from the left side of the runway to the right. It didn’t feel like we were hanging on the prop, just that we were proceeding down the runway at a sedate pace. I knew I’d seen this sight picture before somewhere but couldn’t figure it out, when Robbie said this was basically a “hover taxi.” That’s it! That’s what this was. We were at the height and speed of a helicopter taxiing but without the need to autorotate should the engine quit. If the engine quit on the SuperSTOl, we’d just plop down on the runway and the amazing landing gear would just soak it up. I’d thought this entire experience would be violent and scary. It was exactly the opposite. I very quickly felt comfortable in the airplane and felt comfortable at low altitudes and low airspeeds. This airplane ticked off all the check boxes. It cost a bit more than the Highlander but it would do more than the Highlander. And with 105 mph cruise, it was fast enough to get where I needed to go. It was pure fun flying behind a Rotax and I was done. I ordered a SuperSTOL a few weeks later and we are planning to start the build in early March of 2018. We’ll be doing the first two weeks at Robbie’s place near New Bern, NC where he will be assisting me and teaching me the proper build techniques. Then Spork and I will bring the plane home to Raleigh and spend (hopefully) the next year completing it. I know it will be a lot of work, and I know it will be a bit commitment of time. But I cannot wait to show my kids what flying can be like. Not go places flying. Flying for the joy of flying.